Contemporary Westerners are caught between contradictory ways of understanding the world: science and faith are seemingly incompatible. And when we experience spiritual openings, when the Presence breaks through into our lives, what do we make of it? 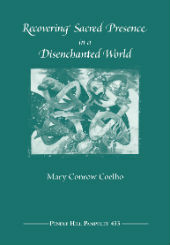 Mary Conrow Coelho, who has studied both science and theology, interprets for Friends a “new way of seeing.” By incorporating scientific breakthroughs which challenge the limits of a materialistic worldview and progressive thinking on the frontiers of theology, she offers a fresh perspective on the place of sacredness in the world and in our own lives.